Christian leaders in Jerusalem have signed an ecumenical message proclaiming the hope of Easter. ‘We, the Patriarchs and Heads of Churches in Jerusalem, join together in proclaiming the triumphant victory of our risen Lord and Saviour Jesus Christ from the dead. The message of Easter, which was first announced in Jerusalem, and has echoed down the centuries, now resounds again in Jerusalem, the city of the Resurrection,’ the statement released on Sunday began. A recent, extensive ecumenical effort saw the restoration of the Holy Aedicule in the Church of the Holy Sepulchre, under which lies what is said to be the original tomb of Jesus Christ. 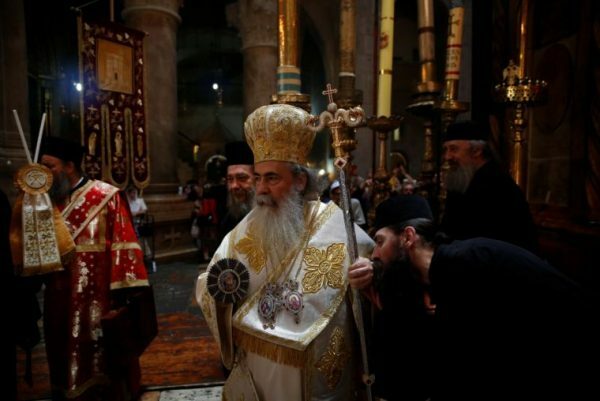 The Greek Orthodox and Armenian Patriarchates of Jerusalem and the Franciscan Custos of the Holy Land, who share the site, had pledged the renovation in a historic moment of unity. ‘The service to celebrate the unveiling of the restored Holy Aedicule was a testimony to our spirit of Ecumenism and a celebration of our unity in Christ. We stood together, as one body, one voice, around the empty tomb. We stood as Christians united in offering hope, perseverance and determination to transform this world under the banner of Christ who conquered all evil through his Resurrection. The Easter message was signed by leading prelates from across Jerusalem churches, including Greek Orthodox Patriarch Theopilos II, Armenian Apostolic Orthodox Patriarch Nourhan Manougian, Archbishop Pierbattista Pizzabella, apostolic administrator of the Latin-rite Catholic Patriarchate of Jerusalem and Father Francesco Patton, the Franciscan Custos of the Holy Land.